The Department of Ayurveda, Himachal Pradesh has released a notification named as HP Ayurveda Recruitment 2018-2019. Therefore, the aspirants who are searching for a Govt Job in Himachal Pradesh State can check the eligibility details and apply for HP Ayurveda Recruitment 2018-2019. In addition to this, we have provided the Salary, Educational Qualification, Selection Process, Age Limit particulars in the below sections of this article. Furthermore, the HP Department of Ayurvedic has issued a notification for the 100 Ayurvedic Medical Officer Positions. And, the deadline for the application process is 20th April 2018. Moreover, we have also provided the Steps To Apply For HP Ayurveda Recruitment 2018-2019 in below. And, competitors can find the link to download the HP Ayurveda Recruitment 2018-2019 Notification at the bottom of this post. Thus, applicants need to refer the whole article to get an overview of the Ayurvedic Medical Officer Recruitment 2018-2019. The officials of the Ayurveda, Himachal Pradesh are started receiving the application forms from a few days back. Therefore, candidates need to complete their registration process as soon as possible. Furthermore, competitors need to verify all the crucial details before starting their registration process. Moreover, we have provided all the information related to the HP Ayurveda Recruitment 2018-2019 for the sake of applicants on this page. Hence, the applicants can view this page before starting their process to get a clarification about the Himachal Pradesh Ayurveda Notification 2018-2019. In addition to this, candidates can also check more Health Jobs in Himachal Pradesh on our website. The aspirants need to fill their application process with the valid information on or before the last date. Moreover, candidates can check all the information regarding HP Ayurveda Recruitment 2018-2019 in this article. And, the contenders can refer the official website of the Ayurveda, Himachal Pradesh for more details. Moreover, we have provided the same particulars on this page for the sake of aspirants. So, the competitors need to check all the eligibility criteria details before starting their application process. In addition to this, candidates can also check more government jobs on our web portal. Furthermore, aspirants can know the official website link from the above table. Candidates need to get from the Recognized Degree in Ayurveda of not less than 05 years duration from a recognized University/Board established by the law of institution recognized by the Central/State Govt./CCIM. Compulsory Rotatory Internship wherever required by the Central Council on Indian Medicine. The Department of Ayurveda, Himachal Pradesh will intimate the date and place of the interview directly to the candidate by an identity authority. So, the aspirants need to wait up to the officials send a message about the interview. Moreover, all the applicants need to once verify all the documents to be attached along with the HP Ayurveda Recruitment 2018-2019 Notification. The officials will reject the application form if any mistakes are found in the certificates. In addition to this, candidates also check all the particulars before submitting the application form. And, the competitors can also find the application form to be filled in the below-attached link. Hence, candidates need to download the HP Ayurveda Recruitment 2018-2019 Notification and check the details. Moreover, candidates need to know the tips of the interview before attending the selection process. For the aspirants who had applied for the HP Ayurveda, Recruitment 2018-2019 need not face written test. The Interview is only the selection process for the applicants. Moreover, the aspirants need to 45 Years and below to apply for the HP Ayurveda Notification 2018-2019. Likewise, aspirants need to check all the details before starting the application process. Moreover, the candidate needs to be a Himachali Bonafide, otherwise, the application will be rejected straightway. And, the contenders need to fill all the columns on the application form. Then only the organization will accept the registration form. Therefore, candidates need to fill all the details which are provided on the application form. In addition to this, candidates need to refer the official notification to get the application fee details. Moreover, the selected candidates need to work in any place of the Himachal Pradesh. And, the aspirants who are recruited for the HP Ayurveda Recruitment 2018-2019 will receive a contract basis with fixed contractual emoluments of Rs 19125/-. In addition to this, contenders need to carry all the documents while attending for the interview. Moreover, the Ayurveda, Himachal Pradesh has not released the date of the interview. So, candidates need to wait few more days to know the details of the interview. Candidates need to be 45 years and Below as on 01st January 2018. 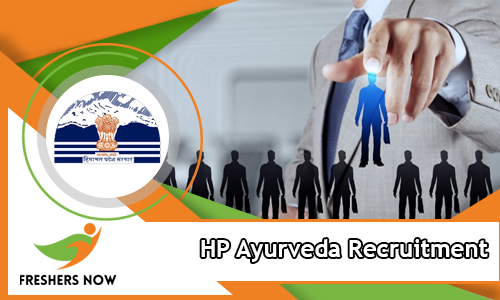 Candidates need to know the procedure to apply for the HP Ayurveda Recruitment 2018-2019. Therefore, we have provided the Step-Wise Procedure in this section for the sake of candidates. We think the given page is useful to all the aspirants to apply for the HP Ayurveda Recruitment 2018-2019. And, candidates having any doubts can leave a comment in the below comment box. Moreover, aspirants need to follow our site Freshers Now to get more fresh updates.